The man Ricky Gervais has described as The funniest, most clich? ?-free comedian on the circuit returns to reinvent stand-up comedy television. Stewart Lee's Comedy Vehicle marks the return of arguably one of Britain's finest stand up comedians and shows him at his masterful and hilarious best. 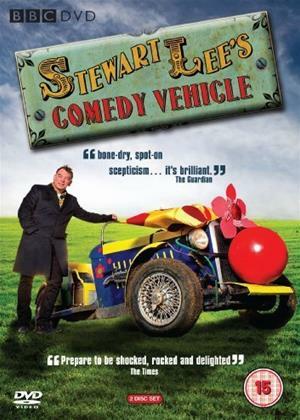 Each of the six episodes sees Stewart explore a different theme, in a stand-up routine illustrated with sketches featuring an ensemble cast of well known comic talent. In each episode Stewart sets out to answer a question that addresses a specific aspect of modern life; Why, for example, is there a tide of banal books in bookshops threatening to engulf us? Does the world really need celebrity hardbacks? Stewart's on a journey to find out - and meets some interesting authors along the way. Has political correctness really gone mad, or is it just that a lot of people confuse political correctness with health and safety legislation? Stewart tries to pick his way through the PC minefield, and reveals how it only made him put on weight. Stewart sets out to discover the truth about popular television duo Ant and Dec, and visits a quaint English village where The Funniest Thing That's Ever Been On Television Ever has given rise to a unique rural tradition. Sort of. Whatever the topic, Stewart addresses it with razor sharp wit, using every argument at his disposal to convey his point. And you'l have learned something along the way (which may or may not be true).